If you follow me on Instagram, you know how quickly I had to make the Moonrise quilt for Mathew of Mister Domestic to get it to Market on time. 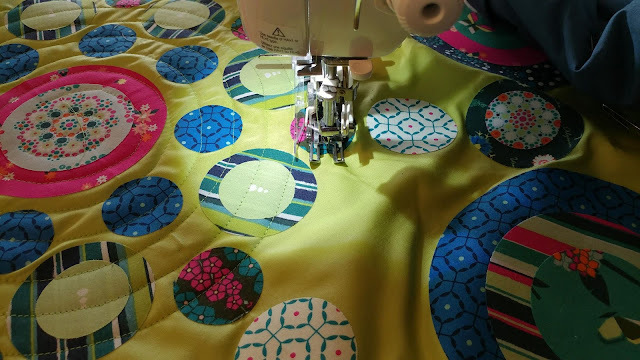 I received the fabrics in the mail on Friday, and I had to ship the finished quilt out on Monday! If you follow Mister Domestic on YouTube, then you may know a bit about the story behind his Loved to Pieces fabric collection. One print in the collection has great personal meaning to him. It is a print inspired by mandalas painted on rocks. As soon as I learned that, I immediately wanted to make my Flurry quilt - which is also inspired by painted rock mandalas! 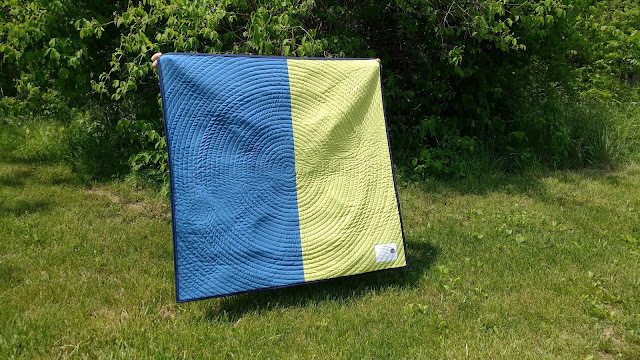 However, Mathew had already picked my Moonrise quilt for his Market booth. But I couldn't shake the desire. I decided before I even got the fabric that I would try to make both! 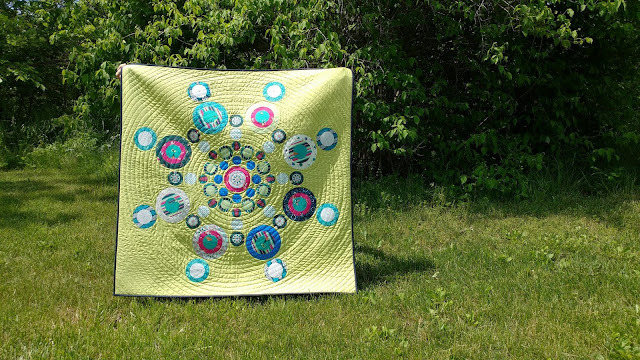 I finished the Moonrise quilt at 10:30pm on Sunday night. Monday morning, I decided to try and make the mini (36" square) version of my Flurry quilt before my post office cut off time of 3pm! I had already fused all the Loved to Pieces fabrics to Lite Steam-A-Seam 2, so I started cutting circles with my Olfa Rotary Circle Cutter. 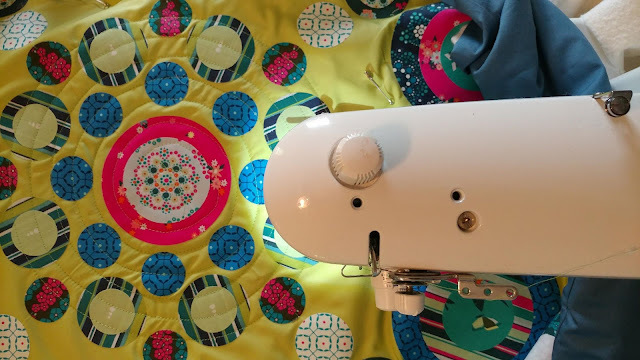 One quality of the Steam-A-Seam is that it creates a permanent bond once pressed and doesn't need extra stitching - perfect when you're quilting in a hurry! 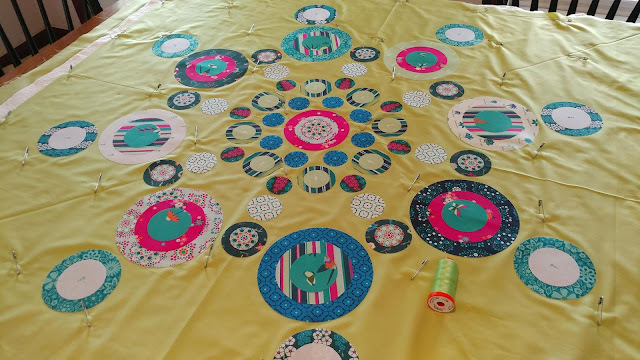 Since I was working with scraps, I had to be quite selective and creative in getting enough circles in the right sizes! 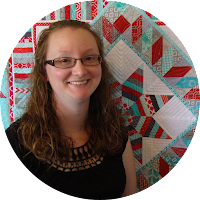 I tried to use every print in the collection in the quilt - but didn't have time to really check to be sure! 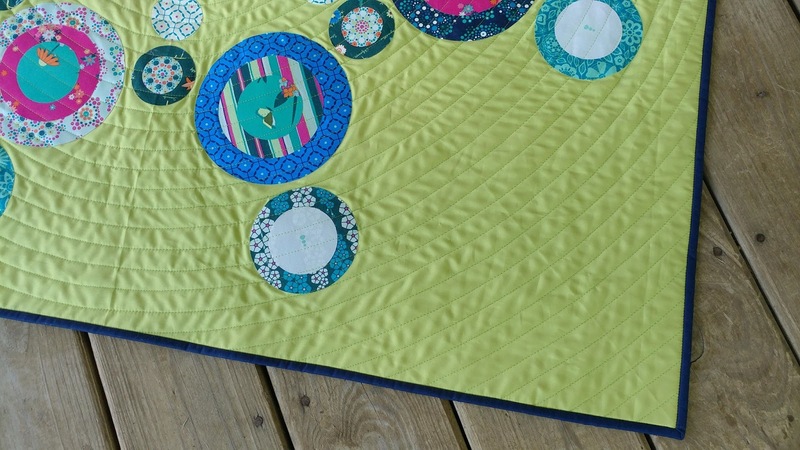 After completing the top, I decided to try spiral quilting again on my Juki TL-2010Q with my walking foot. 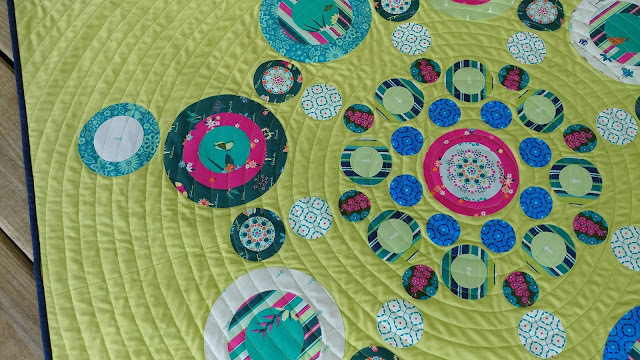 I knew it would complement the circle design, but also be quick without any starts/stops during the quilting. 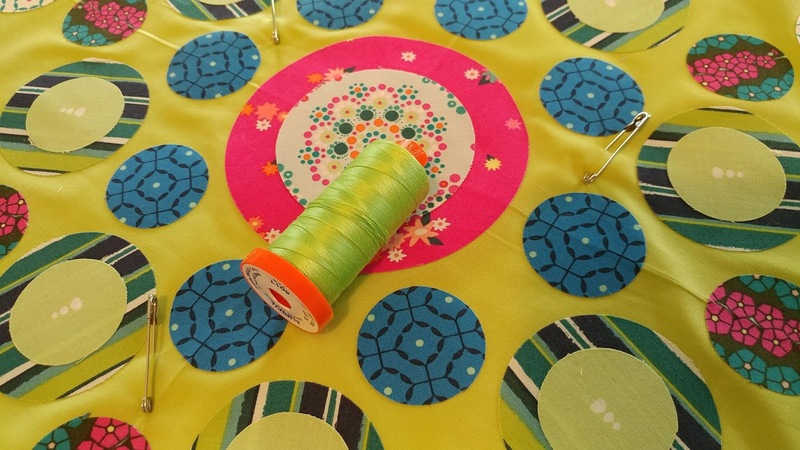 I chose 50wt Aurifil #5017 Shining Green for the quilting. It was a great match to the AGF solid in Appletini! 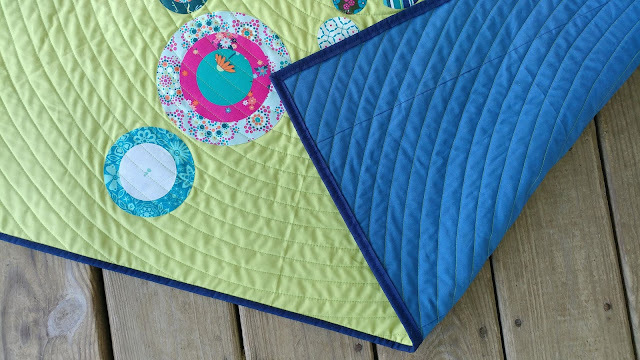 I pin basted the quilt with Warm & Natural batting. I pieced the back with the AGF solids I had left from the Moonrise quilt - Appletini and Denim Blue. My husband kept telling me how much time I had left so I would keep sewing fast! He even fed me lunch so I didn't have to stop! True love! I only ran out of bobbin thread once, right when the spiral got to the very edge of the quilt. With just 20 minutes until needing to head to the post office, I trimmed the quilt, made the binding from the AGF solid Nocturnal, and stitched it on by machine super fast. My husband grabbed the quilt and we ran outside for a couple photos. Then I threw it in the box, taped it up, and he ran out the door to go to the post office! Afterwards, I wondered if there might still be a pin stuck in it! I didn't even have time to look it over! I sure hope Mathew feels the love, meaning, and purpose in the quilt. 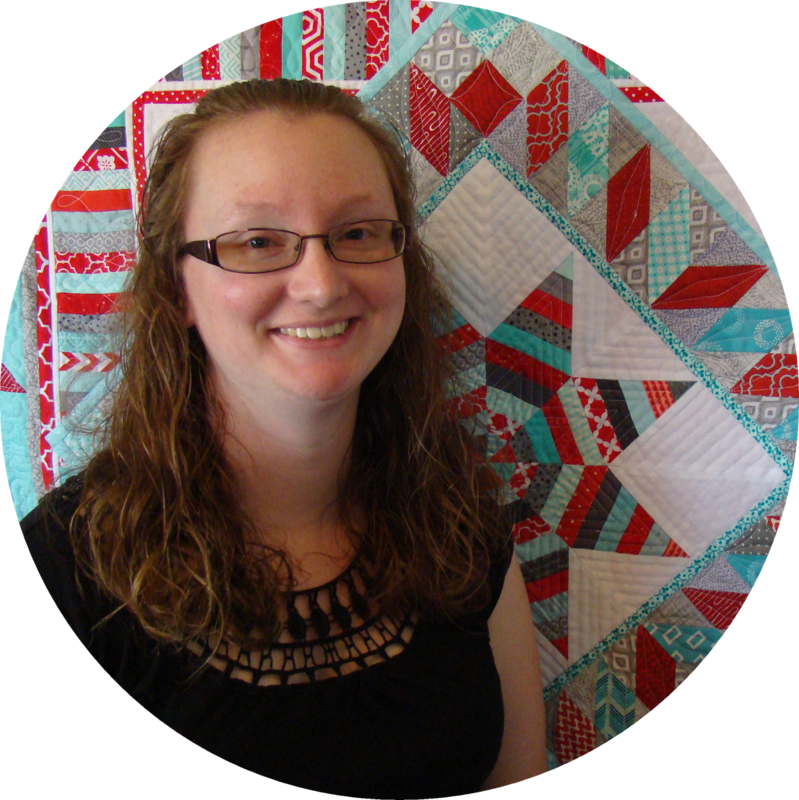 I wrote a quick note trying to convey my thoughts and be clear that the quilt was a gift. I hope it will be a keepsake for him to always remember his first fabric collection. I have no idea if he will use the quilt in his booth at Quilt Market, or if he'll publicly show the quilt, or if he'll even like it. 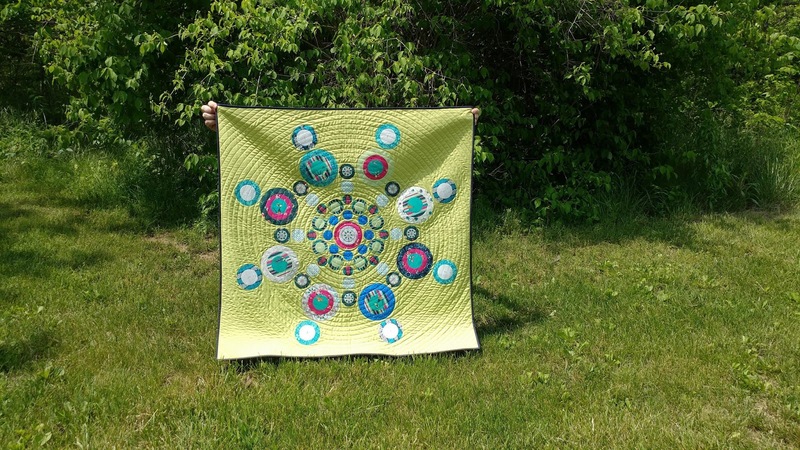 The quilt wasn't part of our "deal," but it captures the real reason I started quilting in the first place - to show love and try to capture meaning for the recipient. Update: Mathew was super surprised and loved it! You can see the quilt in his post on Instagram here, in an Art Gallery Fabrics video from Quilt Market here, and in a video tour of his booth here! 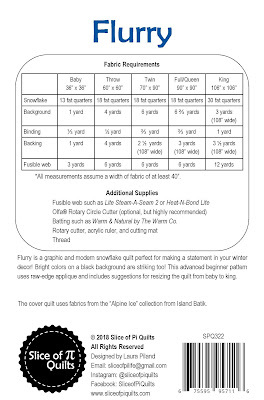 The Flurry quilt pattern is available digitally on Etsy and Craftsy. Paper patterns will ship next week. 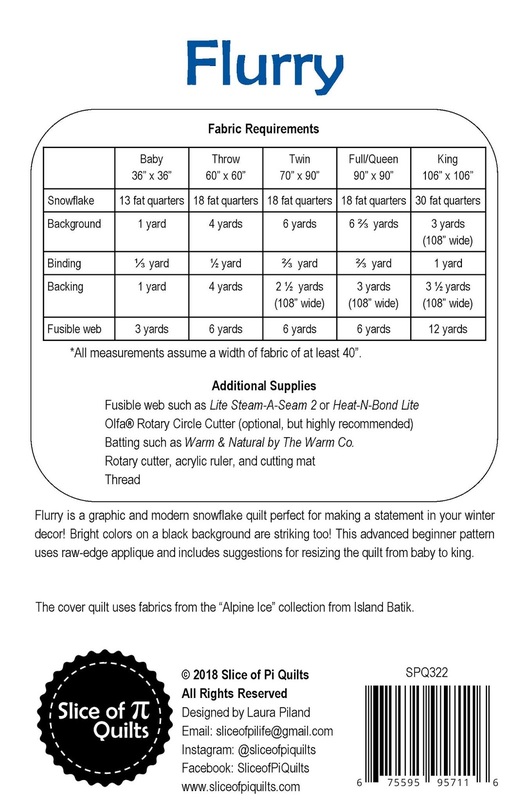 The quilt on the cover of the pattern is made with Island Batik fabrics. You can read more about that quilt here. The smaller 36" version isn't as dramatic as the larger throw sized version, but I love how it shows a completely different color palette! You have touched my heart deeper than you will ever know. When I opened the box, I first read the label and note without even looking at the quilt. Upon realizing what you had done, I opened up the quilt and immediately burst into tears. I felt both your love and the love of my sister in the quilt and I will most definitely cherish this my entire life. Thank you doesn’t express my gratitude enough. "Set a goal and go for it" could be your motto. And such wonderful assistance from your husband to make it work. I was thinking that Matthew would certainly love it, and from the sounds of his thank you, he surely does! 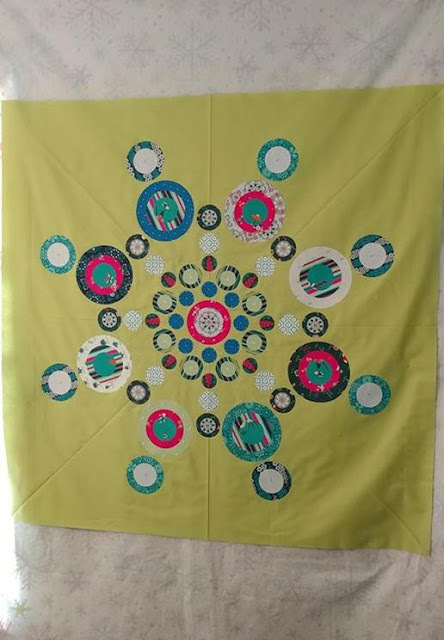 Beautiful quilt, beautiful thoughts to go with it. 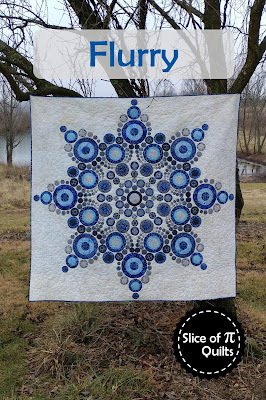 What a wonderful quilt to showcase Mathew's new fabric line. You are a special friend. I don't remember how I found you, but I am so grateful I did. Your work is beautiful, inspiring, innovative, it just blows my mind! You go girl!! Go after your dreams and spread love at the same time--there is nothing better in life than that!! Oh and I think your husband and mine could swap some great "quilting wife" stories!! Your creation under pressure and a tight deadline creates some very amazing and powerful work. Simply amazing and what a kind, thoughtful gift. A gorgeous quilt and I'm sure it will be appreciated. I hope it is hanging in his booth at the show. Beautiful spiral quilting. What an amazing story and gift. I am amazed by your generosity, thoughtfulness, and speed!